Nineteen-year-old Star Collins never intended to return to her hometown, Avenue. That part of her life ended when she was nine years old, and child services took her away from her hoarder mother. Her mother chose her stuff over her daughter. That part of her life was supposed to be in the past. But her mother has just passed away and Star finds herself giving up her summer to quietly clean out her old home. She just wants to sell it and move on with her life. However, things aren't going the way she planned. With her dyed-black hair and tattoos, she's attracting almost as much attention from the small town residents as Ash Winthrope, the guy who was just released from prison. All Ash wants is a chance to start over. He screwed up and he knows it, he's going to have to live with the guilt for the rest of his life. But he's stuck in Avenue until his parole ends, and no one, not even his own parents, wants anything to do with him. Nearly out of money and completely out of options, Ash takes the only job he can, helping Star haul stuff out of her mother's house. Neither of them expects anything to happen between them, or for their lives to change. But sometimes meeting the right person is all it takes. 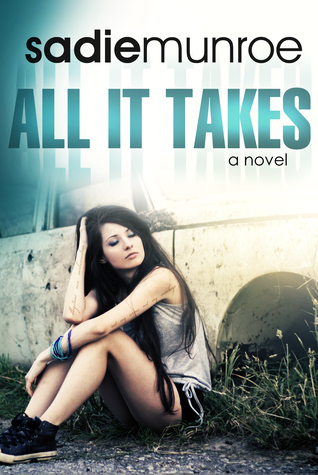 “All It Takes” is a story about a young woman named Star, who has just lost her mother, and a young man named Ash, who has recently been released from prison for manslaughter. Both outcasts in a small town, they end up working together, and the story builds from there. The story itself is at turns tragic and cute and romantic. There are some difficult issues raised about drug use, hoarding (I need to clean out all of our closets now), the foster care system, and how people treat one another. The characters themselves are rough around the edges while also endearing, and up until the end the pacing was steady ,and the writing lends itself to a quick read. Unfortunately, in spite of all of the opportunities to explore such deep issues, there was a real lack of depth. The characters had many qualities, but they were barely touched upon in lieu of each of them thinking how hot the other looked. Constantly. The alternating viewpoints were a bit of a problem for me, as Star was much more realistically written than Ash. I have no issue with strong language, but it was beyond excessive in Ash’s thoughts and dialogue. Finally, the pace was thrown off at the very end and felt rushed. All of that being said, “All It Takes” is not a bad book, I just wish it had been less superficial. If you’re looking for a good romance to read at the beach, give it a try. This review is based upon a complimentary copy provided by the author in exchange for an honest review. "Exceedingly clever and surprisingly unsettling, Damage Done is an unforgettable read." --Melissa Marr, New York Times bestselling author of Made for You "In her incredible debut novel, Amanda Panitch leaves you on the edge of your seat. Prepare to be stunned. Prepare to be torn apart." --Roxane Gay, New York Times bestselling author of Bad Feminist "A brilliant thriller. Gillian Flynn for the YA set." --Amy Christine Parker, author of Gated 22 minutes separate Julia Vann's before and after. Before: Julia had a twin brother, a boyfriend, and a best friend. After: She has a new identity, a new hometown, and memories of those twenty-two minutes that refuse to come into focus. At least, that's what she tells the police. Now that she's Lucy Black, her fresh start has attracted the attention of one of the hottest guys in school. And someone much more dangerous. She thought her brother's crimes were behind her. But now she's being forced to confront the dark secrets she thought were safely left behind. How far will Julia go to keep her slate clean? One thing is clear: The damage done can never be erased. It's only just beginning. . . . In this deliciously twisted contemporary thriller, family can be a real killer. For fans of We Were Liars and readers who love unique multiple perspectives that leave clues like breadcrumbs until they reach the stunning conclusion. From the Hardcover edition. Julia Vann is living a new life after a horrific crime committed by her twin brother, Ryan. The story is told in her voice, which is very well-written and easy to read. While her circumstances are extraordinary, she is going through many things that are relatable to anyone who has been a teenager: crushes, social cliques, distant parents, and assorted other annoying adults. She’s definitely a narrator that leaves the reader wanting to know more. The plot is perfectly paced with small flashbacks to the past written in with what is currently happening. To add a bit of an outside view, there are a few notes from Ryan’s psychologist added between some of the chapters. It allows the reader to learn the entire story at a slow pace, or if they prefer playing detective, gives enough clues and room between them for many theories to be developed. Be warned: The book is quite disturbing and does have graphic violence as well as animal deaths. I believe that none of it was gratuitous in terms of the story and was a necessity in establishing the pattern of a growing sociopath. I can’t say much else without spoilers, but if you’re squeamish this is not the book for you. I definitely recommend “Damage Done” for all adults and older young adults who like twisted thrillers and mysteries with a good dose of psychology. Please take note of the older above. It isn’t a good choice at all for the younger YA readers. This review is based upon a complimentary copy provided by the publisher in exchange for an honest review. A powerful debut novel about a Greek American family and its enigmatic patriarch from a riveting new voice in contemporary literature. Stavros Stavros Mavrakis, Greek immigrant and proud owner of the Gala Diner, believes he has just ten days to live. As he prepares for his final hours, he sends a scathing email to his ex-wife and three grown daughters, outlining his wishes for how they each might better live their lives. With varying degrees of laughter and scorn, his family and friends dismiss his behavior as nothing more than a plea for attention, but when Stavros disappears, those closest to him are forced to confront the possibility of his death. A vibrant tour de force that races to a surprising conclusion, Let Me Explain You is told from multiple perspectives: Stavros Stavros, brimming with pride and cursing in broken English; his eldest daughter Stavroula, a talented chef in love with her boss’s daughter; her sister, the wounded but resilient Litza; and many other voices who compose a veritable Greek chorus. By turns hilarious and deeply moving, this multigenerational novel delivers a heartfelt meditation on the power of storytelling and family, the relationship between fathers and daughters, and also the complex bond of sisterhood. Annie Liontas explores our origins and family myths, hunger and what feeds us, reinvention and forgiveness. “Let Me Explain You” is a difficult book to review. On one hand, the writing is beautiful and tragicomic. On the other, it can be outrageously offensive. I’ve given it four stars, but please be sure to thoroughly read my review and any others you may find to see if it’s a good fit for you. 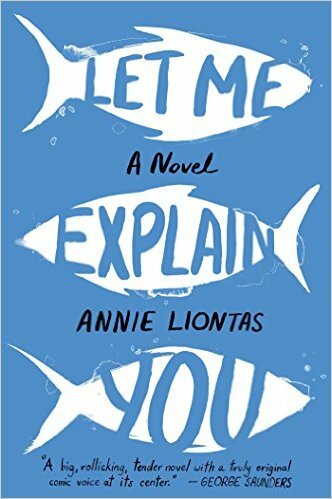 At its heart, “Let Me Explain You” is a story about the American Dream, reality, and the hot mess that makes up most families, whether we want to admit it or not. It begins with Stavros Stavros Mavrakis (actual name) writing an email to his ex-wife and daughters, announcing that he will be dying in ten days. As the reader will soon come to learn about Mavrakis himself, it is in parts tender, sad, and downright mean. That’s the tone for the entire book. While parts had me laughing out loud, others made me want to choke Mr. Mavrakis, and some made me want to cry. To me that’s wonderful writing. The sections about the interactions between the family were my favorites, because we all have those relationships that are love/hate. Or, at times, hate/hate. It was all very realistic with excellent character development. Unfortunately, the main character is pretty much the equivalent of your racist uncle at a holiday dinner. He has opinions, he does not care if you like them, he believes everyone needs to hear them, and at some point you realize he is in reality a bitter old man who is lonely. So, if you can have a conversation with “that uncle” and still be able to see some good in him, you will probably enjoy this book. If you avoid family dinners because of him, then avoid it. As for myself, I found “Let Me Explain You” an excellent debut novel and look forward to reading more from the author. As this is an adult book, there are no content warnings. In the bestselling tradition of Bill Bryson and Tony Horwitz, Rinker Buck's The Oregon Trail is a major work of participatory history: an epic account of traveling the 2,000-mile length of the Oregon Trail the old-fashioned way, in a covered wagon with a team of mules—which hasn't been done in a century—that also tells the rich history of the trail, the people who made the migration, and its significance to the country. Spanning 2,000 miles and traversing six states from Missouri to the Pacific Ocean, the Oregon Trail is the route that made America. In the fifteen years before the Civil War, when 400,000 pioneers used it to emigrate West—historians still regard this as the largest land migration of all time—the trail united the coasts, doubled the size of the country, and laid the groundwork for the railroads. The trail years also solidified the American character: our plucky determination in the face of adversity, our impetuous cycle of financial bubbles and busts, the fractious clash of ethnic populations competing for the same jobs and space. Today, amazingly, the trail is all but forgotten. Rinker Buck is no stranger to grand adventures. The New Yorker described his first travel narrative,Flight of Passage, as “a funny, cocky gem of a book,” and with The Oregon Trailhe seeks to bring the most important road in American history back to life. At once a majestic American journey, a significant work of history, and a personal saga reminiscent of bestsellers by Bill Bryson and Cheryl Strayed, the book tells the story of Buck's 2,000-mile expedition across the plains with tremendous humor and heart. He was accompanied by three cantankerous mules, his boisterous brother, Nick, and an “incurably filthy” Jack Russell terrier named Olive Oyl. Along the way, Buck dodges thunderstorms in Nebraska, chases his runaway mules across miles of Wyoming plains, scouts more than five hundred miles of nearly vanished trail on foot, crosses the Rockies, makes desperate fifty-mile forced marches for water, and repairs so many broken wheels and axels that he nearly reinvents the art of wagon travel itself. Apart from charting his own geographical and emotional adventure, Buck introduces readers to the evangelists, shysters, natives, trailblazers, and everyday dreamers who were among the first of the pioneers to make the journey west. With a rare narrative power, a refreshing candor about his own weakness and mistakes, and an extremely attractive obsession for history and travel,The Oregon Trail draws readers into the journey of a lifetime. I should be upfront and say that this review of “The Oregon Trail: A New American Journey” may be skewed because the author, Rinker Buck, did something in writing it that I have always wanted to do. He took a piece of history, researched it, and then set out to live it. This is basically a historian’s dream. There are actually two parts to the book: the journey itself and the history of the Oregon Trail. I’ll begin with the journey. The time and effort Mr. Buck took in researching and developing his plans for the trip are astounding. Quite a bit of time went into planning the journey to avoid modern civilization as much as possible, and even the wagon was purchased in Missouri and authentic. The author has a true way with words. The descriptions of the scenery along the way are breathtaking, and the stories of what happens along the way make you feel as if you are riding along shotgun. Conversations with his brother add a very real familial element to it all. The only downside is it can drag a bit at times, but then again, I’m sure the journey did as well. “The Oregon Trail: A New American Journey” is an excellent book from both a historical and an autobiographical standpoint, but it’s more than that. It’s a good and entertaining story for high schoolers and up. Even those who don’t like nonfiction or history will like this one. Never underestimate the power of a determined witch. Letum Wood is a forest of fog and deadfall, home to the quietly famous Miss Mabel’s School for Girls, a place where young witches learn the art of magic. Sixteen-year-old Bianca Monroe has inherited a deadly curse. Determined to break free before it kills her, she enrolls in the respected school to confront the cunning witch who cast the curse: Miss Mabel. Bianca finds herself faced with dark magic she didn’t expect, with lessons more dangerous than she could have ever imagined. Will Bianca have the courage to save herself from the curse, or will Miss Mabel’s sinister plan be too powerful? 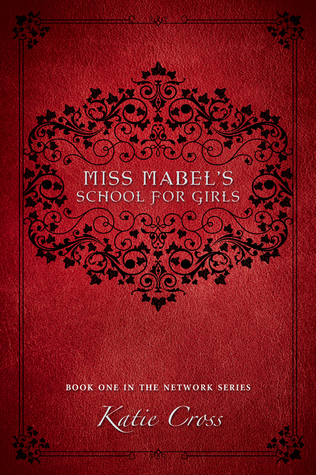 Miss Mabel’s School for Girls is the first novel in The Network Series, an exciting new fantasy collection. A gripping tale about the struggle to survive, it will take you to a new place and time, one you’ll never want to leave. “Miss Mabel’s School for Girls” is one of those books that makes me wish for a half-star rating system. It is better than a three, but not good enough for a four, and it is frustrating not to be able to show that properly. At any rate, it is definitely a good book, but not a great one. I really love the world of witchcraft called The Network that the author built. It’s filled with everything a good fantasy or fairy-tale should have: mystery, wonder, good, and evil. How things came to be the way they are is explained thoroughly and naturally, with the history of The Network and all other details being revealed as part of the plot, as opposed to being all dropped on the reader at once. Bianca is a wonderful and strong female protagonist, and aside from her beloved Papa, there are no males involved in her life. In other words: if you’re looking for a romance, go elsewhere. This one is about girl-power, and it lives up to the potential to stand on that without a love interest. Very well done! My problem with the book, and the reason that it is not four stars, is that it dragged quite a bit. The plot was slowed down by some unnecessary wandering and really yanked me out of what was an otherwise good story. With some more editing, it really could be great. It seems like a minor complaint compared to all of the wonderful qualities, but it really was that much of a block to the enjoyment of it all. Overall, if you like magical worlds and witches, please give “Miss Mabel’s School for Girls” a read. Aside from violence, there is nothing to be of concern to parents of younger middle-aged readers. If they can handle Harry Potter, they can handle this. I do plan on reading the next in the hopes of a more consistent plot pace. Lady A is the most notorious blackmailer in the city. With just a mask and a gown to disguise her, she sweeps into lavish balls and exclusive events collecting the most valuable currency in 1725 London-secrets. But leading a double life isn't easy. By day Lady A is just a seventeen-year-old girl named Arista who lives in fear of her abusive master,Bones, and passes herself off as a boy to move safely through the squalor of London's slums. When Bones attempts to dispose of his pawn forever, Arista is rescued by the last person she expects: Jonathan Wild, an infamous thief who moves seamlessly between the city's criminal underworld and its most elite circles. Arista partners with Wild on her own terms in order to save enough money to buy passage out of London. Everything changes when she meets Grae Sinclair, the son of a wealthy merchant. Grae has traveled the world, seen the exotic lands Arista has longed to escape to her whole life, and he loves Arista for who she is-not for what she can do for him. Being with Grae gives something Arista something precious that she swore off long ago: hope. He has promised to help Arista escape the life of crime that has claimed her since she was a child. But can you ever truly escape the past? “Tangled Webs” is a book that promises a glimpse into the seamy underbelly of Elizabethan England, following the life of a teenager who grew up in the household of a thief who used orphans to profit by committing crimes. The premise is a good one and the world is built well, but unfortunately, it did not live up to the promise of what could have been. As far as the plot goes, it is a very interesting idea. Had it been told in a different style, with some character development tweaked, I believe it could have been much better. The problem is, it is extremely dense. It is almost entirely descriptive. Even lines of dialogue come with flowery descriptions. Perhaps it was in an effort to use third person the way it would be written in the time period, but it did nothing but irritate me as the book went along. A better balance between description and dialogue would have made for much better pacing, and I believe more reluctant young adult readers will give up on the story after a chapter or two. The character development ranged from iffy to outstanding. Many secondary and background characters give the reader an instant overview of who they are through a couple of well-written sentences. I applaud the author on her ability to do that so well. Arista, the main character, and her partner in crime Nik, are intriguing and well-written. Grae, the love interest, is an “instalove” who seems to have the personality of a rock. I’m not sure why Arista would even notice him, aside from his stalker tendencies, let alone fall instantly in love with him. It detracts from the romantic aspect of the book. I would like to point out a few wonderful details thrown in from history. The Haymarket Theatre is wonderfully described, and Voltaire and the enlightenment are touched upon briefly. Other details of life in the time are also included, and they flow seamlessly with the story, as opposed to being forced in there to establish time and place. As an aside, the book itself is beautiful designed in a way reminiscent of the era. Overall, “Tangled Webs” is a disappointment, but I can say that I will read the next installment. There are possibilities for it to become something great, and I look forward to seeing if there is an evolution in the storytelling. This definitely isn’t a book for reluctant or impatient readers, but if you like historical novels or flowery prose, it may be worth a try.